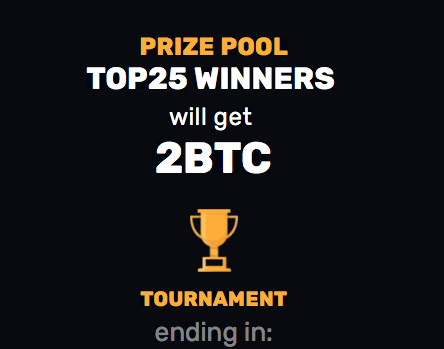 This weeks Bitcoin Casino tournament offers the top 25 winners 2 BTC. No matter what slot game you play you’ll be automatically subscribed to the weekly 2BTC race. The tournament runs on a «bet size». You earn 1 point for every 0.001 BTC wagered in Slots (If you have an active bonus, you can’t get any points). The more points you collect, the higher your position in the leaderboard will be. The more you bet, the more points you receive. Top 25 qualified players who make the best results will be awarded with casino prizes. The leaderboard will be displayed while you play on the right and also at this very page after the end of tournament. All prizes will be deposited to winners accounts instantly after the end of the tournament. All prizes are paid in BTC. Try Out the Tournament Now and Win Bitcoin! This entry was posted on Saturday, March 17th, 2018 at 5:51 pm	and is filed under Online Slots. You can follow any responses to this entry through the RSS 2.0 feed. Both comments and pings are currently closed.